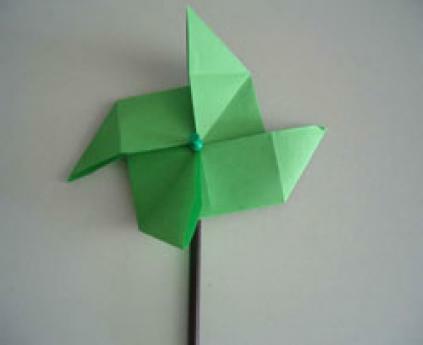 This children craft is an origami classic. A perfect present for a younger brothers birthday. Fold and unfold the sheet to mark the two diagonals. Fold and unfold the sheet in longitudinal direction. Fold and unfold the right and left flaps towards the central fold. Fold point A up and the opposite point down, as in the photo. Open the windmill sails to let the wind enter. Hold the windmill to the stick with the drawing pin.